...it is only reasonable that Chokey the Chimp should take a skeptical interest. This one merits an Extreme Crap Factoid Alert. Although RemedyForce is their product, we can't lay this one at BMC's door. BMC has been a long-standing contributor to Chokey the Chimp's Crap Factoids. But even by BMC's standards this one is a doozey. There is no BMC logo on the document, just Nucleus Research. It is published on the BMC website. Interestingly even BMC weren't touching these outrageous claims. BMC's own case study of Lumen21 mentions the "30% increase in productivity" but goes nowhere near the Nucleus crap factoids. However BMC did award Lumen21 their "Customer Connect Award". I mean FFS, who is going to take those numbers at face value? Just about everyone apparently. It has been four months since that crap was published and googling I cannot find a single doubting voice. Sad. So here is one voice: mine. Let's take a wee look at the claims shall we? It is - of course - bull excrement. Crudely crafted excrement at that. By automating service ticket generation, e-mail responses, ticket updates, and customer satisfaction surveys, BMC [Sic. I think they mean the client Lumen21] was able to increase its activity by 30 percent without increasing staff. This productivity was equivalent to saving 15 full-time employees at an average fully loaded cost of $100,000 per employee. This is totally unsubstantiated. It sounds suspiciously wet-finger to me. I'm betting it was a throw-away remark, a guesstimate by a senior exec in an interview, though of course I can't prove that because the study gives us no data. 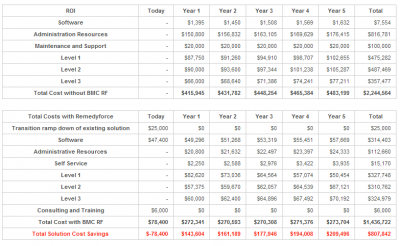 Although Lumen21’s staffing did not change, it was able to complete 30 percent more work after deploying BMC Remedyforce. Ah, more "work". We're none the wiser. None of the increased throughput was due to changes in process or skills. It all came from a new tool. Without a new tool, an increase in throughput would have required a linear increase in staff numbers; 30% more transactions requires 30% more staff. This denies any economies of scale. The workload increase was evenly distributed across the 50 staff to which the 30% presumably applies (even that 50 sounds suspiciously rounded to me). Say the increase is in requests processed and say half of those staff do nothing related to processing requests, then the hypothetical increase in staff would have been 30% of 25, not 30% of 50. We will never know. So that's the only benefit in the study: $1.5M a year in hypothetically avoided increase in staff. 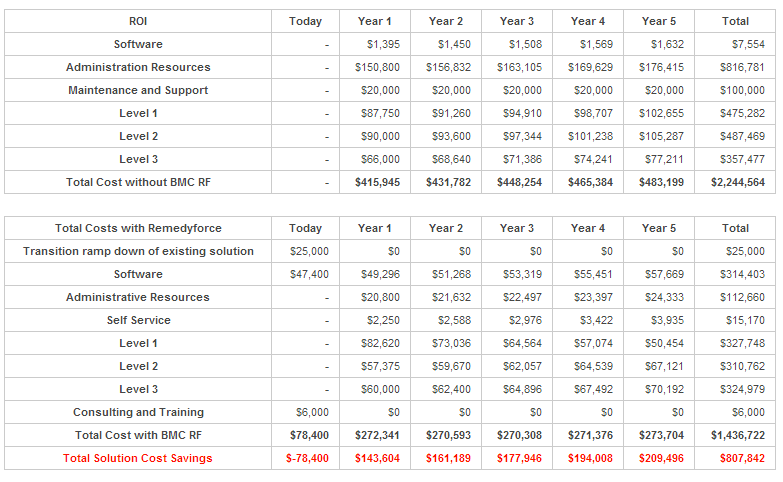 internal labor associated with deploying BMC Remedyforce. The crap here is being shovelled. Self-service opportunities. Lumen21 originally required all tickets to go through a call center. This process was labor intensive and ignored the trends supporting employee self-service. Lumen21 provided a productive and efficient portal for multi-channel support based on client preferences. ...apparently at no cost to set up, deploy, or run. License costs weren't $15,000 for 50 users; they were $50,000. Setup costs weren't $5846, they were $78,400. Operational savings weren't $1.5M p.a., they were $200k p.a. which sets my skeptical radar buzzing but at least is within the bounds of credibility. The ROI calculator may not bear close examination but I would need a much finer-tooth comb to find the nits than I did on this ridiculous case study. One would hope that most intelligent people would scoff, but Nucleus and Lumen21 are trumpeting it everywhere: Nucleus gave Lumen21 an award (read: press-release-generator), and Lumen21 presented at DreamForce. Of course this has nothing to do with Lumen21 being still in a venture-funding phase of business development.